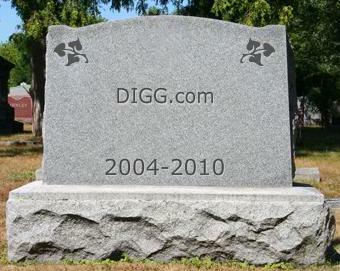 It was a good run, Digg.com. You certainly had a great idea and funneled plenty of Web traffic to opportunistic and manipulative publishers. Alas, the run is over. And it's not coming back. According to the latest Compete.com data (April, 2010) Digg lost an astounding 13.8 million unique visits from March to April, 2010 -- a near 36 percent drop. Apparently sensing impending doom, Digg founder Kevin Rose has made several announcements of retooling Digg, but nothing has materialized. In fact, the announcements might have been the worst thing Digg founder Kevin Rose could have done. It's been over a year since Rose announced that changes would come. In the mean time, Facebook and Twitter have soared and it appears the Digg crowd grew tired of waiting. While the changes seem to be close to a reality now, it's too late. A recently released video demonstrates what will change with the new Digg. And, by all accounts, it's another social network. An unnecessary one. The main focus is to make friends (starting by importing your social graph from sites like Facebook) and Digg stories. Then, your new Digg page will show the stories Dugg most by all your friends. Sound like something your friends "liked" on Facebook? Or perhaps something retweeted on Twitter? The biggest problem with Digg in the past was that unless you devoted serious time to it and knew how to work the system, you had little hope of ever making the front page. The only stories that made the front page were typically those voted up by voting blocs; networks of like-minded individuals attempting to send streams of traffic to each others' sites no matter the content of the story. And if you didn't make the front page, the benefits were very little, if any. Now, you still will need to dedicate serious time to the site -- only this time you won't receive near the level of exposure. That is, unless your "friends" vote up your stories at a breakneck pace. Which, for all intents and purposes, puts us right back where we started with Digg. In other words, there's no innovation here and the real value proposition of Digg hasn't changed, it's just become more labor intensive. In the soon-to-be end, Digg will become known as the first network to die from social fatigue. Facebook and Twitter are booming, LinkedIn is holding steady and even MySpace seems to have settled into a niche. But Digg is in a deadly, unrecoverable tail spin. The fact is, people -- real people -- are beginning to tire. Submit this, upload that, vote on this, "like" that, be my "friend", check in here, suggest this, retweet that ... there's already so much to do. The only thing left to "Digg" is a grave.